"Everybody Loves Pizza is a celebration of America's favorite dish -- its history, its versatility, its staying power. It delves into where pizza came from, where it's going, and what it means to American culture. Thanks to food writers, pizza insiders, and ordinary, pizza-loving Americans, it also reveals where to find 540 top-notch pizzas across the country, plus recipes from the familiar (Pepperoni or Barbecue Chicken Pizza) to the adventurous (Shrimp Pizza with Tasso Ham, Goat Cheese, and Spinach or Prosciutto Pear Pizza). 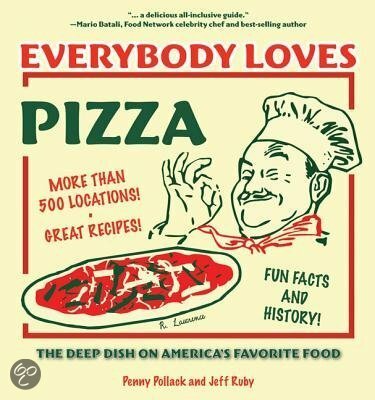 short_description"Everybody Loves Pizza is a celebration of America's favorite dish -- its history, its versatility, its staying power. It delves into where pizza came from, where it's going, and what it means to American culture. Thanks to food writers, pizza insiders, and ordinary, pizza-loving Americans, it also reveals where to find 540 top-notch pizzas across the country, plus recipes from the familiar (Pepperoni or Barbecue Chicken Pizza) to the adventurous (Shrimp Pizza with Tasso Ham, Goat Cheese, and Spinach or Prosciutto Pear Pizza). long_description"Everybody Loves Pizza is a celebration of America's favorite dish -- its history, its versatility, its staying power. It delves into where pizza came from, where it's going, and what it means to American culture. Thanks to food writers, pizza insiders, and ordinary, pizza-loving Americans, it also reveals where to find 540 top-notch pizzas across the country, plus recipes from the familiar (Pepperoni or Barbecue Chicken Pizza) to the adventurous (Shrimp Pizza with Tasso Ham, Goat Cheese, and Spinach or Prosciutto Pear Pizza).